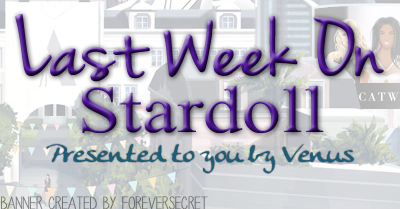 Previous week on Stardoll was so, so slow, that I was worried there won't be anything for me to recap. I realized I would have to add one thing that I don't usually write about, since I need to recap at least 3 things in my post. Ready or not, here we go. The thing I mentioned I don't usually recap is a release of another stardesign item, this time a shorts. Those type of shorts look great for summer, and are quite popular both on Stardoll and real life. On Stardoll, you can make endless types, and from designs I saw in comments, I liked American flag design for shorts, or blue/black ripped denim. And they would look really cool with a pair of converses and a basic white top. I guess, I'm not really a fashion expert. On Wednesday, we got (back) a new/old store - Fever. Anyone remembers the previous collection? Bright colors, way too bright. It makes me wonder what this collection has in common with a previous collection, aside from a name? Here we can see mostly pastel colors. Lack or a minimum of patterns may be a common thing. The items are nice, summer-y, and quite wearable. There is an interesting pair of items - a leather vest and sleeves. It would be usually sold as one piece, but Stardoll made it interesting by separating it and making users able to mix and match and make interesting outfits using either of them. I wish they separated a white top and black skirt in 3rd outfit from right though too. Anyway, way better than the previous collection. Friday is usually a day for limited stuff, but not necessarily amount limited stuff. Anyway remembers SubCouture store? This Friday we got 3rd collection. Take a look at it. Fantastic, unique, couture pieces is what makes this store special. Like the last 2 times, the collection was available to be bought for only 48 hours. There were 3 items for superstars only, which isn't a new thing for this store, and luckily for many, they stayed whole 48 hours, unlike the last time. As I said, those are not outfits for your everyday look, but rather for some special events and occasions. I liked some pieces, some not so much, but decided to buy a whole collection, as I already own the previous 2 ones. Shoes are fantastic too. Anyway, this is one of my favorite Stardoll stores, as the prices match the quality and items are truly fabulous. That's it, believe it or not! I know, I wish we got more stuff, but at least I will have some time to try selling some stuff, get more stardollars. See you next Sunday!